Chorus is available as part of the Phaser effect, just choose Chorus as the number of stages. But not so fast, there is actually a Chorus effect hiding in the Delay effect, just waiting to come out if the right settings are used. Let’s walk through setting up a custom Chorus effect and in the process you will understand how it works. Chorus is a time varying delay effect, when the delay amount varies it creates a pitch shift. Combining slightly pitch-shifted signals with the original gives the classic Chorus sound. The delay time used in the Chorus is very short, just a few milliseconds. First enable the delay effect. At the end of the left and right delay time knobs there are settings for 12.1 ms, 8.0 ms, and 6.4 ms. These, and also the 1/128 time, are what are used for the effect. By setting the left and right times to different settings, you can get a slightly altered effect. Set the Delay mode to Normal, typically with Spread above 0%, and turn the feedback near zero. The delay modulation is important for the Chorus effect. The modulation changes the delay times with an LFO, with the left and right times being offset 180 degrees modulated by a triangle wave. It is recommended that you set the modulation amount around 20% and the modulation rate to around 1.00 Hz. A mix of 70% sounds good. Now you have a typical Chorus effect setup with Expanse. Solina here we come. You can take the basic Chorus idea and make it into something more unique. One easy thing to do is to choose the delay type Reverse which gets pretty interesting. Note that Ping Pong does not work too well. You can also add feedback, which is the concept of a Flanger. To take the Chorus to the next level you can create your own modulation. Turn the Delay modulation amount to zero. Now you can use a general purpose LFO, or even two LFOs, to control the delay times. In the Mod Matrix, route the LFOs to the Delay Left Time and Delay Right Time. You just need a tiny amount of modulation, use the shift key while dragging to get a precise amount. If you use one LFO, make the modulation amount negative for one of the sides. If you use two LFOs, you can choose different waveforms or different rates, or both. 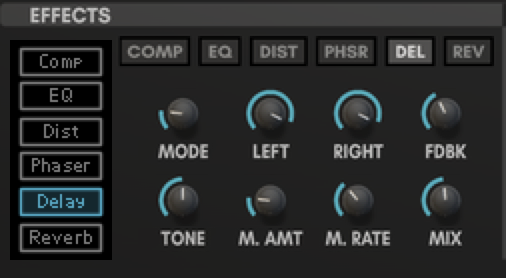 You may just want to use a sine wave since the Chorus in Expanse uses a triangle wave. Now you have a very unique Chorus effect. In the above image, one LFO is used. Below, two LFOs are used for ultimate Chorus craziness. Try out the example patches to hear the results. Enjoy your Chorus effect!